According to several major studies, older adults with hearing loss are more likely to develop Alzheimer’s disease and dementia, compared to those with normal hearing. 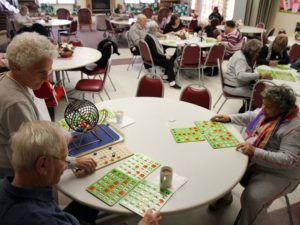 Adding Hearing Loops in the dining halls, activity areas, chapel and individual rooms increases the social aspect of those in a retirement home by improving and ensuring the quality of life for seniors with compatible hearing aids or cochlear implants. There are a variety of Hearing Loop options available, both permanent and portable. New on the market is a Hearing Loop Table, which is an ADA compliant hand-crafted table with a built in hearing loop system with mics on all 4 corners. For users with a hearing instrument with t-coil or with the use of a Loop Listener, the speech at the Table will go directly into the user’s ear, significantly reducing background noise. The Hearing Loop Table produces clear sound, allowing improved comprehension and communication in settings with ambient noise, a perfect addition to a retirement home’s game night.